M. Leiris, Lam, Milan, Fratelli Fabbri, 1970, no. 162 (illustrated). Exhibition catalogue, Wifredo Lam: opere scelte, Milan, Galleria Nuovo Sagittario, 1975, no. 14 (illustrated in color). Exhibition catalogue, Wifredo Lam, Rome, Galleria d'Arte La Borgognona, 1976 (illustrated). M-P. Fouchet, Wifredo Lam, 1st ed., Barcelona/Paris, Poligrafa/Cercle d'Ar, 1976, p. 240, no. 508 (illustrated). M-P. Fouchet, Wifredo Lam, 2nd ed., Barcelona/Paris, Polígrafa/Cercle d'Art, 1989, p. 260, no. 540 (illustrated). L. Laurin-Lam and E. Lam, Wifredo Lam: Catalogue Raisonné of the Painted Work, Volume II 1961-1982, Acatos, Lausanne, 2002, p. 277, no. 64.10 (illustrated). 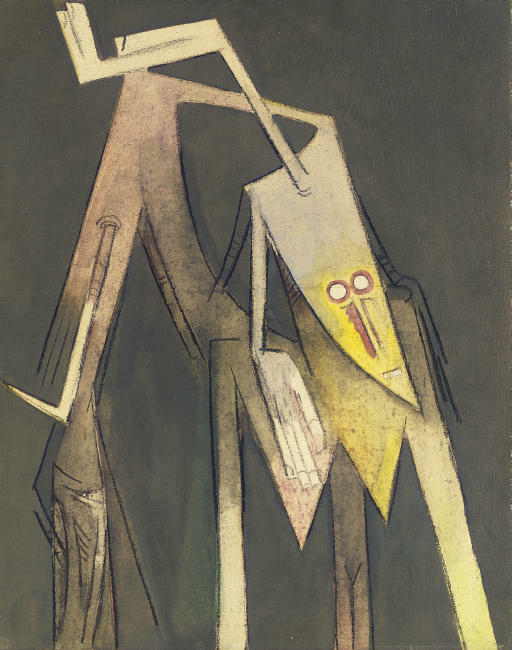 Milan, Galleria Nuovo Sagittario, Wifredo Lam: opere scelte, 1975, no. 14. Rome, Galleria d'Arte La Borgognona, Wifredo Lam, 1976. This work is sold with a certificate of authenticity signed by the artist, dated October 17, 1977. Lam returned to Paris in 1952, after spending ten years in his native Cuba. The works he created upon his visit to the island, particularly between 1942 and 1950, constitute a significant body of work and led the artist to the iconic imagery of his late works. The principal forms, gestures, figures and stylistic elements seen in Lam's Parisian works have their origins in works from the 1940s, when Lam embraced Surrealism and returned to his homeland as an adult and a mature artist. In 1923, Lam left Cuba for Spain to study art, eventually moving to Paris in 1938, where he came into contact with Picasso and was influenced by his work and by Cubism and by collections of African art he encountered there. In 1942, escaping the Second World War, Lam returned to Havana via trans-Atlantic trip to Martinique with a number of European intellectuals, including André Breton and Claude Levi-Strauss. Surrealism, in particular, became an important force in his work; its influence was cemented during this historic trip. While in the Caribbean together, Lam and Breton attended vodou ceremonies in Haiti and together produced Fata Morgana, Breton's epic poem about his self-imposed exile illustrated by Lam. The images Lam created for Breton's poem develop his interest in presenting a body that is part animal, part human. From this, he developed his well-known femme cheval (horse woman) figure. Other signature tropes also developed from these drawings, including elongated chins and noses and protruding horns. He also begins to elongate limbs and necks, forms that will eventually become cylindrical appendages in larger paintings. These elongated limbs and features would also become references to sexual organs and to narratives of Afro-Cuban ceremonial rites. In Les bras sur la tête (La Mano nella Testa), we see the development of these figures from those present in works of the mid-1940s and 1950s. Here, the forms of human limbs have become angular, planar shapes that merely allude to body parts. Significantly, the hands--vastly and pointedly enlarged--have nearly taken over the image. Referred to in the title, the hand that juts from the head moves across the top center of the canvas to rest at its very edge, as though forcefully creating a space for the figures present. Also central to this period in Lam's work is the influence of the Chilean painter Roberto Matta (1911-2002). Significantly, it was also André Breton who introduced Matta to Surrealism. Matta left Chile for Paris in 1933 and also spent ten years in New York before returning to Paris in 1948. Perhaps most noteworthy in Matta's work, as it relates to Lam's, is his description of his work as a kind of landscape of the interior mind, or inscape. His blending of mechanical, natural, and human forms across an invented landscape--a reference to the intricate workings of the subconscious--are similar to Lam's own figures that perform a variety of acts and movements linked to the supernatural. In Lam's paintings of the 1940s, his figures alluded to rites and rituals of Santeria (now Lucumí) as practiced in Havana and elsewhere in the Caribbean. There are remnants of the performative aspects of this, mixed with Matta's influence, in Lam's later paintings. Matta's works feature dream-like settings, extended limbs, and complex figures that hybridize mechanical and human parts in much the same way that Lam's figures conflate human and animal parts. In Lam's later paintings, the settings are hazy, undefined, dark, and solid-colored, as in many works by Matta from the same period. Across this backdrop, Lam's figures--mostly hands, heads and impossibly long limbs--move across the plane in a slow, surreal dance. 1) A. Breton, Le Surrealisme et la Peinture, p. 171.